This is a great tasting and healthy green smoothie recipe that I love to drink for brunch. It’s got a sweet and fruity taste with a hint of wheat grass flavoring. The strawberries and pineapple really compliment one another, while the bananas add some nice thickness to and sweetness to the smoothie. There are five ingredients to this green smoothie. I don’t always measure the exact amounts of each ingredient, and you should feel free to change the proportions of the ingredients to best suit your taste-buds or fitness goals. The following is the combination I like best. 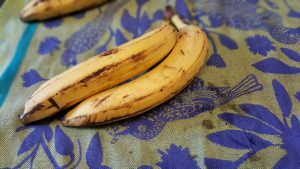 Start with a couple ripe bananas. Bananas are very popular in smoothie recipes. They provide a natural way of adding sweet flavor to the smoothie and also making smoothies thicker. Banana’s also happen to have great nutritional value. This includes being packed with potassium, vitamin B6, and manganese. I like my bananas to be ripe. That means no green on the outside, and a bit of browning. As long as they have not gotten squishy, they are fine. Once they get squishy or fully brown they are overripe. Next, add about a cup worth of strawberries. Often I use frozen strawberries, but because it is winter, I don’t want this smoothie being too cold. 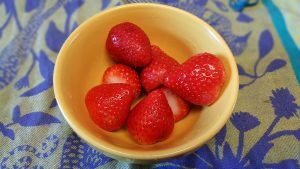 Today I am using fresh strawberries. When adding strawberries to a smoothie I cut off the green ends. Be sure to wash the strawberries. I usually add the wheat grass next. My local grocery store sells fresh wheat grass for about 3 dollars. The wheat grass comes in a little plant container and I can continue to grow it in my windowsill until I use it all up. You can check your local grocery store or health food store to see if they also sell fresh wheat grass. If not, you can order a growing kit online and grow a little bit in your kitchen. If you do not have fresh wheat grass, you may be able to find a shot of wheat grass juice, which will also work for this smoothie recipe. I find that wheat grass has a pretty strong flavor. It basically tastes the way grass smells when you mow a lawn. It’s not bad, but it’s not something I would really want to eat on its own. That’s why I like this smoothie recipe. I get the nutrition of wheat grass without having to deal with the taste. I don’t really measure the amount of wheat grass I use. 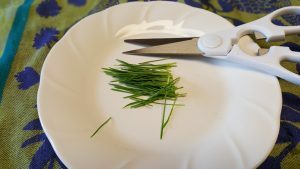 I just snip off a bit from the grass that is growing in my windowsill. I’m guessing this is about 2 ounces worth of wheat grass. That’s the amount of wheat grass they usually add into a commercial smoothie. Next up I add about 2 cups worth of fresh baby spinach. 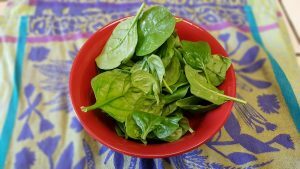 Spinach is great for you, and it has a fairly mild flavor so it’s great in green smoothies. Arugula is another amazing leafy green, and I substitute it for the spinach sometimes, but it has such a strong flavor. The flavor or arugula overpowers the other flavors in this smoothie. That’s why spinach is great. You are eating something super healthy without masking the great flavors of the other ingredients. Finally, I throw in a cup of pineapple. I add the pineapple after the spinach so that the spinach gets pushed down into the blades of the blender a little easier. If I were to add the spinach last, the blender might not catch it as well. There are times where I am making a smoothie and the spinach just gets stuck in the blender above the mixing smoothie. As with the strawberries, I often use frozen pineapple. It’s cheaper to get it frozen, and the nutritional value is pretty much the same as fresh pineapple. Frozen pineapple is especially good when I am in a hurry because it is pre-cut. It takes a while to cup open a fresh pineapple. 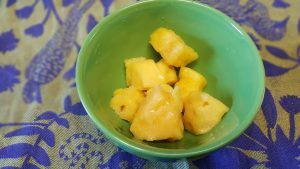 Pineapple has such a unique flavor, I love how well it blends with the other ingredients. Once all the ingredients are in the blender I pour in about 3/4 cups of water and blend away. I continue to blend until the smoothie is smooth and there are no chunks of frozen fruit left. I like to use frozen strawberries and frozen pineapple in this recipe. This makes the smoothie cold and thick. Frozen fruit keeps almost all the nutritional value of fresh fruit and is almost always cheaper than fresh fruit. But fresh fruit works just as well as frozen. Place all the ingredients into your blender. If you are using frozen fruit, do not place those at the very bottom, as that will make it harder for the blender to start blending. I usually add bananas in first, as I never use frozen bananas. Once fully blended, serve and drink. This recipe makes about two large mugs worth of smoothie. You can also keep this smoothie in the refrigerator for about 24 hours, just be sure to re-mix the smoothie with a spoon before drinking, as it tends to thicken when it sits still for a while. I like to keep this smoothie light and not too sugary, so I don’t use juice, but feel free to use about 3/4 cup orange juice or coconut water instead of plain water. If you want some additional calories add a spoonful of almond butter or protein powder. For additional nutrition add a scoop of your favorite supplement powder, such as Vitamineral Green. Next story Extra Virgin Versus Pure Olive Oil In Smoothies?